Protract WS - Aniruddha Enterprises Pvt. Ltd. The quality of drinking water for poultry and its effect on performance have been of concern to poultry producers. Water makes up a large proportion of the body of the chicken, 55% to 75%, therefore it is essential that the quality of the drinking water is not compromised. The bird consumes 1.5 to 2 times as much water as it does feed. Contamination of drinking water negatively affects poultry performance. 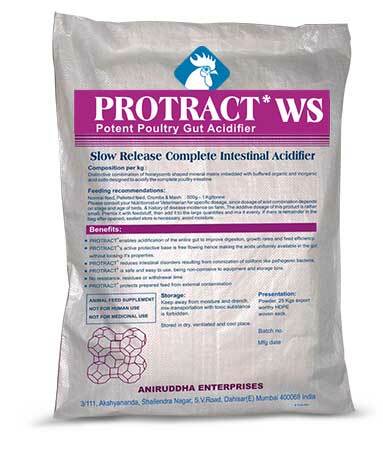 Protract* WS is a potent acidifier for poultry. The low pKa value of Protract* WS can penetrate the bacteria cell wall and disrupt the normal physiology of pathogenic bacteria. Poultry water treatment through acidification of the drinking water acidifies the crop, thereby encouraging the growth of favorable microflora while deterring pathogenic bacteria that can harm intestine. Water acidification is most critical during the establishment of intestinal microflora. Using Protract*WS to reduce the pH of drinking water to 4.0 helps the birds maintain the stability of intestinal microflora. The establishment & maintenance of healthy intestinal microflora improves live production performance. Protract* WS is in powder form and is instantly & completely soluble in water.